News 8's Ashley Jacobs spent time with the North County band 'Trouble in the Wind' as they prepare for their KAABOO debut. Other local bands are encouraged to see if they have what it takes. SAN DIEGO (NEWS 8) - News 8's Ashley Jacobs spent time with the North County band 'Trouble in the Wind' as they prepare for their KAABOO debut. Other local bands are encouraged to see if they have what it takes. The Discovery Tour joins this list of 2017 acts including Trouble in the Wind, Kira Lingman, Josh Arbour and many more. 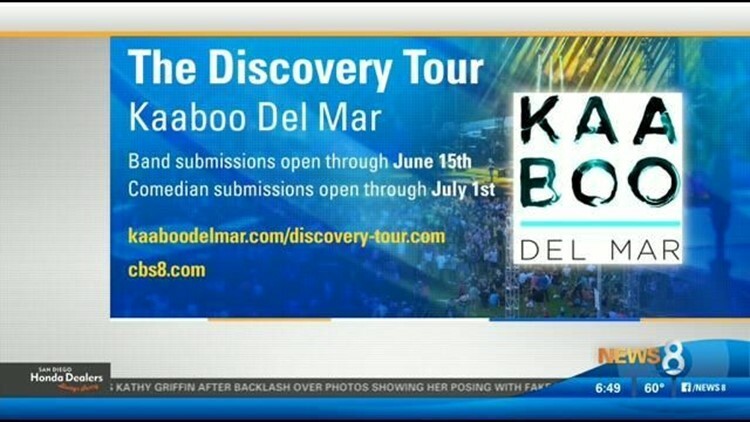 KAABOO will return September 15 - 17, 2017 and three local musicians and one comedian will have the chance to take the stage alongside the music acts in the lineup, including Red Hot Chili Peppers, P!nk, Tom Petty & The Heartbreakers and Muse. Band submissions will be open through Thursday, June 15 and Comedian submissions will be open through Saturday, July 1.